Everyone owns a pair of jeans. Okay, maybe not everyone — but this is America. Jeans are our cultural icon, right up there with fireworks and bald eagles. As a culture, we’ve embraced denim in jackets, ripped jeans and even the occasional suit. But the position of ‘cultural icon’ means that while most people have passing familiarity with denim, they might not know the history or intricacies of the fabric. Most denim that you’ll encounter in your life is probably not going to be ‘raw denim.’ Raw, or unwashed, denim is a fabric of denim manufactured in an older process, eschewing the more mechanized practices of mass-produced denim that is all the rage today. But why should you care about raws? Here are a few reasons. Raw denim, since it’s unwashed (and not predistressed) starts off heavy and rough. Over time, it will stretch to fit your body better than any pair of washed denim you can find, and it will get comfortable. I promise. Price to quality ratio. Raw denim is not cheap. That’s indisputable. Almost across the board, raw denim is more expensive than its washed counterparts. Raw denim manufacturing means making small runs of jeans, more handmade details and higher quality materials. But the payoff is noticeable — a well-cared for pair of raws can last you around a decade, and each year will only make them fade harder and fit softer. For a greater context, let’s back up a bit. Denim is a cotton fabric with roots in the city of Nîmes, France. Levi Strauss (the dude who started Levi’s in the 1800s) called it serge de Nîmes, which eventually got shortened down to ‘de Nîmes’, then to simply ‘denim.’ The term ‘jeans’ comes from the French term for Genoa, Italy, (Gênes), the first city where there is a record of denim trousers being manufactured. Denim is a twill-weave fabric, traditionally dyed indigo on the outside-facing warp threads, leaving the weft interior threads undyed cotton. 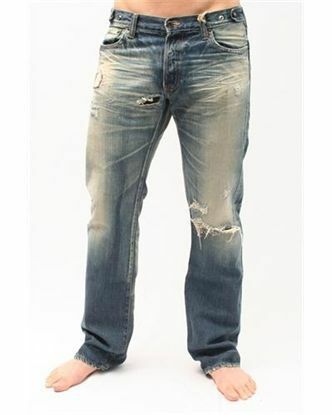 This contributes to the ‘fading’ effect in jeans over time, as the outside dye wears off, and the interior threads start peeking through at points of wear and crease. Newer denim manufacturers sometimes experiment with this and use a different color dye on the interior threads, such that when they start to wear through you’ll see more of the interior color. 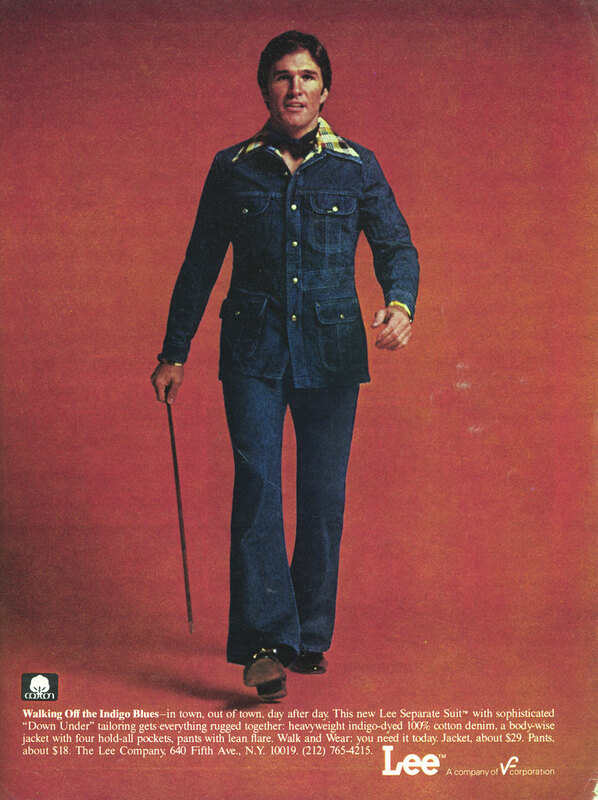 Prior to about 1960, all denim was ‘raw’ (also called ‘dry’ or ‘unwashed.’) The rise of youth culture after World War II meant that the slower, heavier shuttle loom manufacturing process needed to be abandoned in favor of larger-scale, easier-to-wear mass-produced denim. A lot of these shuttle looms were bought by small denim makers in Japan around this time, which explains the vast numbers of Japanese raw denim manufacturers. The term ‘raw’ denotes that during the production of the denim, the fabric was not soaked or washed to lock in the coloring. Unwashed, ‘raw’ denim is noticeably darker than washed denim, and the ‘fades’ are higher contrast, as the outside dye is more volatile and susceptible to bleeding off the fabric (and onto your shoes, usually.) Many pairs of raw denim are also selvedge, though not all. ‘Selvedge’ is a French corruption of the English word ‘self-edge.’ Shuttle looms, the heavier, bigger granddaddies of denim production, produce thicker, heavier cuts of denim than their mass-production descendants. One of the defining traits of higher-quality denim is the selvedge line that you can see on the upturned cuffs of denim dorks around the world. Real selvedge lines, like the ones above, are a visible indication that the denim used to make the jeans was made on a shuttle loom. In a shuttle loom, the selvedge is the actual ‘edge’ of the denim fabric as it comes out of the loom. Non-selvedge denim uses an overlock stitch in place of a self-edge, which allows for more pairs of jeans to be made out of the same yardage of denim. As such, projectile looms dominate most of the denim market, often sacrifi cing quality for quantity. The color of the stripe was originally a denotation of the mill where they were produced. This is sometimes true now, but it’s not a particularly useful metric. Most mills worldwide now produce their own custom selvedge stripes. A note on weight: Denim weight is measured by a square yard of fabric, laid flat. Most denim you’d buy that isn’t raw is about 7–10 ounces. Traditionally, raw denim begins at about 12 ounces. It will feel very heavy and stiff in comparison to cheaper denim options. This is normal. Over time, it wears in, stretches out and gets softer. Online! Okay, not necessarily just online. I’ll try and break down some options, and some places that sell them. Most brands offer sizing charts for their denim on their websites, and I highly recommend paying close attention to this when buying a pair. As a disclaimer, most raw denim manufacturers do not make distinct womenswear cuts. Consequently, they are usually more expensive or harder to find. Denim cut for menswear tends to have a lower rise (aka, a shorter distance between the crotch and the belt loop) and a straighter leg (less tapered). They also tend to be cut longer and wider. Unbranded is the go-to for cheap raw denim. Offering a range of cuts (tight, skinny, tapered, and straight) starting at about $80-$140 a pair. Unbranded is a great choice for your first pair of raw denim. Pictured above are UB101s, a 14.5-ounce Japanese-denim skinny fit jean. Check their sizing charts for exact measurements. Red Cotton Denim is a relative newcomer to the denim scene. They offer a range of cuts at a decent price point ($125–$145) and a commitment to handmade, quality manufacturing. Their jeans come in 12 or 16 ounce, and slim/tapered fits. Their denim is sourced from Cone Mills, one of the few American raw denim mills still operating. Naked & Famous is a brand known for quality denim. They’re actually the parent company of Unbranded, but offer a wider range of cuts and denim at a slightly higher price point. N&F has menswear and womenswear denim in a huge range of cuts, fades and fabrics, from about $140–$270. They’ve become known for their denim ‘experiments,’ including the infamous Rainbow Core, Thermochromic and Holographic Denim. You can check them out at Tate + Yoko. 3sixteen is a New York City-based brand that makes heavy use of Japanese Kuroki Mills denim. They offer a number of cuts and weights and a degree of craftsmanship that fits their higher price tag. A pair of 3sixteen will run you from $215-$350. 3sixteen+ is their collaboration line with Self Edge and offers a few variants of standard 3sixteen jeans with some special limited-edition bonuses. Check out both 3sixteen and 3sixteen+ at Self Edge’s website or the Self Edge stores in Portland and San Francisco. Imogene + Willie is an American brand with American denim and construction. They’re known for having one of the widest selections of womenswear raw denim, with eight different cuts available. While it might not be the heaviest selection (ranging from about 12 ounce to 16 ounce) I+W is a quality brand with dedication to heritage materials and construction. Their cuts range from $225–$250 apiece, and you can find them on their web store, or their shop in Portland. 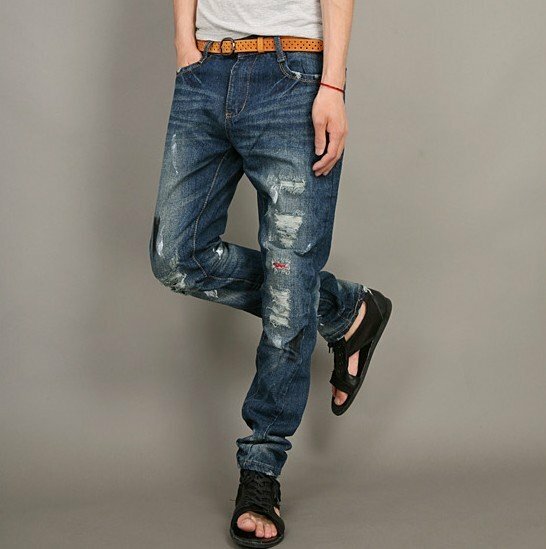 In the past couple of years, raw denim has become kind of a “thing” in popular media and culture. It’s a fabric with a deep connection to American culture, and also one with a fascinating history around the world. Buying a pair of raws means that you are investing in a piece of clothing that will grow and age with you, and over time become one of the most comfortable pieces in your wardrobe. In the end, they’re pants. They’re just cool, expensive, pants. Fashion is a journey. Wear cool pants. Posted on April 14, 2015 April 15, 2015 by hsteinkopffrank	This entry was posted in Street Style. Bookmark the permalink.